Krista Weiss loves working with students of all ages and abilities! She currently teaches clarinet and bass clarinet at both the Kenwood and Florence Willis Music locations. 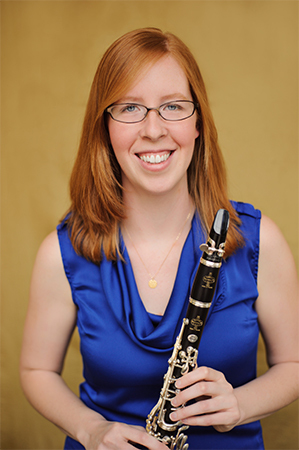 Krista attended Indiana University where she received both her Bachelor and Master’s Degrees in Clarinet Performance. As a performer, Krista has recently played with the Cincinnati Symphony, Dayton Philharmonic, Louisville Orchestra, Lexington Philharmonic, Indianapolis Symphony, Cincinnati Chamber Orchestra, Indianapolis Chamber Orchestra, Indianapolis Opera, Kentucky Symphony, Blue Ash Montgomery Symphony, and Fort Wayne Philharmonic. She has also spent several summers participating in music festivals, including the Aspen Music Festival, National Repertory Orchestra, Chautauqua Music Festival, Brevard Music Center, and Marrowstone Music Festival. During the 2010-2011 academic year Krista served as the clarinet instructor at Indiana State University in Terre Haute, Indiana. In addition to playing and teaching, Krista currently serves as an Artist Clinician for D’Addario Woodwinds and has traveled to dozens of schools across the Midwest to give clinics on clarinet fundamentals and equipment. Look at all the clarinets we carry at Willis Music.